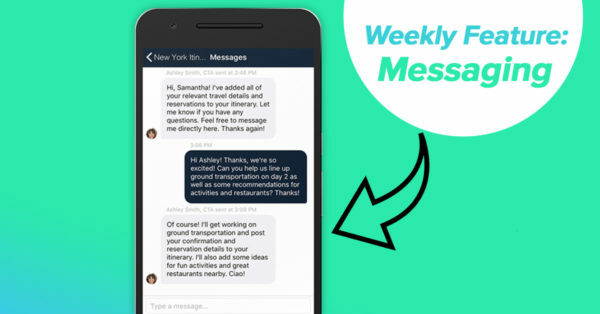 Did you know that the Trip Plans and Travefy Pro mobile app has a built-in messaging feature? This allows you to stay connected with your client(s) before, during, or after a trip. Talk about white glove service, right? After you have shared the trip itinerary you created with your clients, they will be able to download the Trip Plans app (only available Travefy Pro Plus users) and view their itinerary on the mobile app but also have the opportunity to message you. They can send a message by clicking on the chat icon on the top right-hand corner of their screen and this opens the message modal. When they send a message you are able to respond via the Travefy Pro app or within the itinerary builder. Can I turn off the messaging feature on some itineraries? Want to try this out? Start a free trial at travefy.com/pro and press “Start Free Trial”. Already a Travefy user but on the Starter plan? Email us at professional@travefy.com and let us know if you’re interested in trying this feature out!